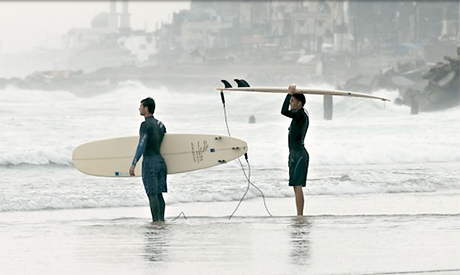 The Gaza Surf Club will be screened at Darb 1718’s open air cinema El-Forn on 5 August. The documentary is by German director Philip Gnadt and Egyptian German director Mickey Yamine, who is also the film’s producer. The film follows a young generation of surfers finding freedom in the waves of the Mediterranean while living in a city ruled by war, occupation, and political gridlock. The directors have been working on the film since 2012. Gnadt founded the production company Substanz Film in 2003 while working as a freelance director. He received the sponsorship prize of the Baden - Wuerttemberg Film Industry in 2003 for the documentary Paula. His graduation film Zwölf Seiten earned him an award at the Independent Days Karlsruhe in 2010. Yamine was born in Cairo and moved to Germany at age 18 and produces films and TV commercials in both Cairo and Berlin. He founded Little Bridge Pictures production company in Berlin in 2013. His graduation film Tropic of Bear won an honorable mention at Festival del Film in Locarno in 2010 and was aired on German TV. Gaza Surf Club was an official selection at the Toronto International Film Festival, Dubai International Film Festival, International Documentary Film Festival of Amsterdam, and the Honolulu Surf Film Festival. The film was previously screened in Cairo at the Goethe Institut in April.